San Miguelito is located 50 miles northwest of the SJO Airport. 75 minutes. Come and enjoy the experience of being emerged in the villages of the Costa Rican coast in the hills of the Center Pacific coast of this beautiful country. We offer a little opportunity for any traveler with any budget! 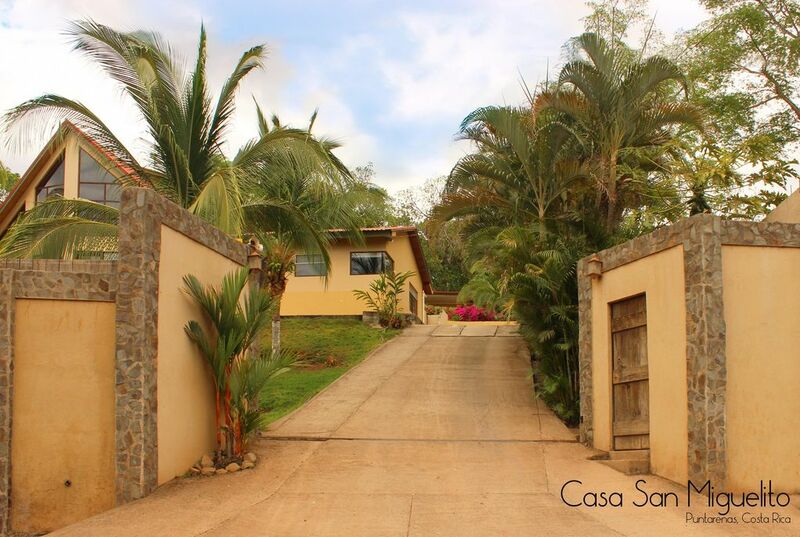 This property features two residential properties inside a gorgeous 1/2 acre compound surrounded by lush gardens, BBQ ranch, swimming pool and beautiful views of the Pacific Ocean. Each house can accommodate four to 5 people. For a combined 9 PAX capacity. Each unit has its own fully equipped kitchenette, TV area, cable, A/C in all bedrooms , Internet, telephone and ADT security alarm system. Covered garage for two cars. Open parking for 3 additional cars. Bus service to surrounding areas every hour in front of the main gate. House caretaker and gardener at the property.... We are available 24/7 to take care of any questions you may have. A combination of simplicity, calmness and adventure- All in one breath! ..unplug your mind experience.... with great local experts. We have a online service in Costa Rica that offers great options with unbeatable prices of Hotel Bookings, tours around the country, vacations rentals and of course services to pamper yourself, like spas- massage-rental cars- chefs- cooks and much more. ... unplug your mind and let us take care of you.. This property was intended for the administrators of a local business recently sold. The house and apartment are fully equipped and furnished. When sold, it became a great option for travelers that really want the Costa Rican experience in one of our villages and away from it all, but, close enough were you can enjoy many activities. You can enjoy a MILLION DOLLAR view and use San Miguelito as your strategic station to visit rain forests, beaches, the Port of Puntarenas, adventures or to simply relax in quietness with family and friends! Secluded in the little town of San Miguelito, Puntarenas (oldest fishing port of the country) were you can enjoy a local experience and also dont forget to order our famous "churchils- Copo" a must. The Village of San Miguelito, Puntarenas can offer a great get together's for families or groups close enough for a ride to the oldest fishing port of CR. Enjoy view of the Gulf of Nicoya. See the cruises arrive. Spectacular sunsets, a total local experience away from it all. THREE UNITS. ONE IN EACH HOUSE AND ONE FOR THE SOCIAL AREA. EACH UNIT HAS DINING TABLES PLUS A TABLE AT THE SOCIAL AREA. ONE STAFF MEMBER/GARDENER AT YOUR DISPOSAL DURING YOUR STAY. (7:00- 16:00) BUT HE IS NOT INTENDED FOR DOMESTIC HELP. SHOULD YOU NEED MAID SERVICES, CHAUFFEUR, COOK OR TOURIST GUIDE WE CAN ARRANGE THAT FOR YOU DEPENDING ON AVAILABILITY, BUT, IT WOULD BE SEPARATE CONTRACTS DIRECTLY WITH THEM. Good spot for a very big group. Iguanas and coconut on the property were fun. Kitchens needed some improvement if you intend to cook a lot. Houses are remote - down a gravel road. We were not able to stay at this place not even for a night but we were lucky enough to get a full refund, the owner and VRBO were amazing on this matter but I will recommend any other accommodation over this place. Beautiful asset but, very poorly maintained. NOT VRBO quality. 2. Neither shower upstairs building worked. 4. Three badly, dangerous rotted out stairs on lower building. 5. AC in lower bd room in lower building didn't work. 6. Basic paint and trim and touch-up throughout. MAP to site is a must. GPS is useless to find. Driveway is super steep; rental car would not make it, even in reverse. 4x4 is advisable. Wainer, the caretaker, saved it all. He is absolutely super!! But this property needs some basic work to be up to the quality of a VRBO. Would pay a bit more if it were fixed up. Thank you for your input, we have already repaired the leak on the upstair kitchen, the showers and the toilet. AC also has been fixed and we are now working on the stairs on lower house. I will also work on a map to get to the house, that is a good idea, usually waze works pretty good. We had a hard time finding the property and they weren't expecting us so getting into the property was not easy. Thank goodness someone was there & finally opened the gate. The property looked nice. Loved the view and the pool was awesome. Very friendly dog. Don't forget to Bring your own towels, soap and toilet paper! San Miguelito is in the heart of Central Pacific Coast. Strategically located to visit Vulcanoes, Rain Forest, Beaches, Bird watching, surfing, sailing, deep sea fishing or stay at home and enjoy the spectacular view of the Gulf, entertain your guests offering a great BBQ with a splash in the refreshing pool. Read, write your book or simply do nothing. Port of Puntarenas receives several cruises per week. Small city with restaurants, beachfront sidewalks, souvenir shopping. U will feel the local Costa Rica touch of a local fishing port. Want to get away but be close to the real Costa Rica? San Miguelito is the answer! !